Instead of Mr. Brownstone, it looks like one fellow might be saying hello to Mr. Big House. Federal authorities say they have arrested a blogger suspected of streaming songs from Guns N' Roses's unreleased album, Chinese Democracy, on his website. According to an arrest affidavit, Cogill admitted to agents that he posted the songs on his website. 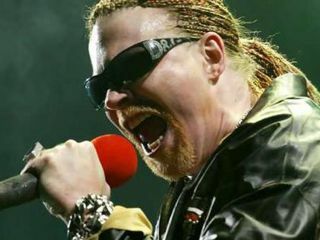 Chinese Democracy has been in the works for more than a decade (and has cost upwards of $15 million), with frontman Axl Rose the only remaining original member of the once mighty group. Rumors that the album may finally be out this fall, possibly as a Best Buy exclusive, have not been confirmed by Guns N' Roses or its management. As for Kevin Cogill, he might still be able to get a copy of Chinese Democracy on cassette. We hear it's the preferred medium in prison.